Arrays We produce custom Linear single-mode or multi-mode fiber arrays with angle polished end silicon v-grooves.Polished ends are AR Coated. Multi-layer,all dielectric AR coatings are applied for peak performance at specified wave lengths in 1350 to 1650 nm range. 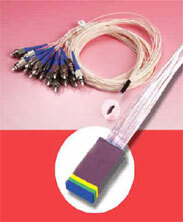 Applications: Optical switches, attenuators, optical Isolators,R&D, etc. Construction Features: Silicon v-grooves, Durable multi-layer dielectric coatings,low absorption characteristics,environmentally-stable,robust and easy-to-clean. Please specify: Number of fibers, pitch, wave length, type of fiber, and polishing angle.